With over 10 years of experience held by our team members combined in using power tools, we spent approximately 40+ hours on product testing and consulted experts for this guide. 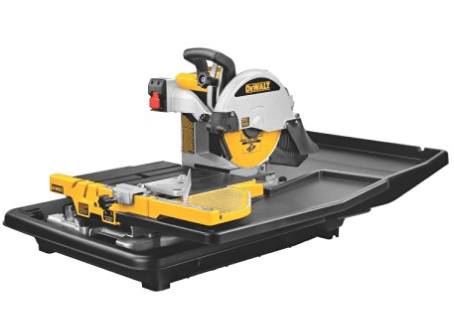 We found that Dewalt D24000S is the best tile saw on the market. It is the best multipurpose and heavy duty wet tile saw, suitable for cutting porcelain, ceramic, granite, marble and even glass tiles. Best for beginners who want to make quick cuts. Perfect for professional usage to cut dense tiles. Provides amazing cuts and even works on bricks. Here's a quick comparison of the 7 best wet tile saws that we think will be worth the buck. This list has all kind of options (heavy duty, light-weight, long blade size, different power sources and varied cutting efficiency), so choose the one that suits your needs the best from the following. We considered the most important factors like weight & brittleness of the tile, the size of the area to be cut, if it is wet/dry and some more. Every brand of tile saw out there has their advantages and disadvantages and in the end, the choice totally depends upon your requirements, so this guide will give you a head start with the help of our research. We have also included the ultimate buying guide to help you make the best choice. Dewalt D24000 is one of the most powerful tile saws with a very strong cutting blade and capacity. Whether you are a professional re-modeller, tile installer, a floor specialist or a DIYer, it can fulfil all needs of a project. Dewalt is a very popular and trustworthy power tools brand and in our honest opinion, D24000 is the best commercial tile saw out there. Below are the tests we conducted that helped us know the details of this wet tile saw. There were no signs of corrosion or rust forming up when we intentionally spilled some water on different parts of this saw and left it for some days. Mainly because of the steel build. The rear and side water attachments and the blade spray helped to clean the tile saw after usage instantly. The cutting cart is rubberised which kept the saw very stable and in turn helped us to make very accurate cuts. Dual Nozzles: The excellent water system with dual nozzles came in handy for adjusting water flow to ensure the saw doesn't overheat and prevent over-spraying. The powerful 1.5HP motor with the diamond blade helped us cut the tiles very smoothly without any issues. It’s 3-1/8-inch cut depth allowed us to even cut the V-caps tiles or pavers with easy angled cuts. There is a special plunge feature which facilitates you to shape the tile pieces meant to accommodate power outlets etc. The first cut we made came out to be a straight and perfectly square. Then we laid a 16x24" porcelain tile, made some miter adjustments and still faced no problems. The blade allows very quick cuts to be made. To cut the holes, we used the plunge feature for the furnace registers. The cuts were super smooth and the sliding tray under the blade made sure there was no chipping at the edges. You can pick up glass blades for cutting glass tiles if you need a perfect edge on materials. This is one of the lightest 10-inch tile saws available in the market today. Though it is big in size, however easy to move and transport. The cart and the water containment tray can be removed and hence can be cleaned easily as well. It is also equipped with a 5-gallon ABS water pan that ensures the ease setup and takedown of the saw. Put the water pump into a 5 gallon bucket which has clean water and not into the tray. When the tray fills up, empty it and fill up the bucket again with clean water. This will prevent all water pump problems. SKIL is known as the effective and budget power tools manufacturer. Be it your kitchen, bathroom or bedroom tiles, SKIL 3540-02 suits best for all the small tiling jobs around the house. 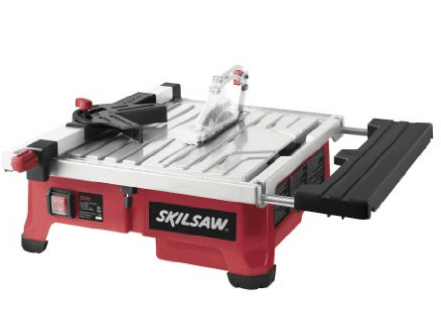 SKIL has established and dedicated itself into the industry and aimed at providing top of the line, unparalleled power tools including their brilliant tile saws. 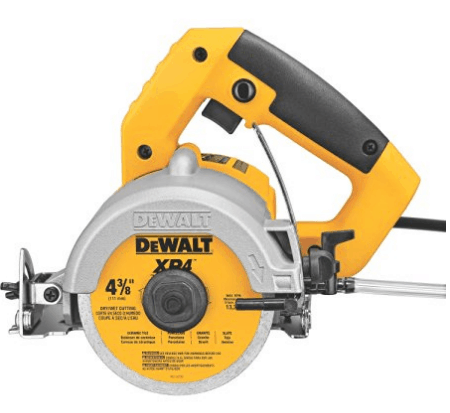 It's not really the contractor grade so do not expect the Dewalt tile saw performance from it. The SKIL 3540-02 is a corrosion resistant (with a stainless steel top) and a very flexible (allows 0 to 45 degree bevel cuts) wet tile saw. It comes with an adjustable rip fence with miter gauge to ensure the accuracy of the straight and miter cuts. 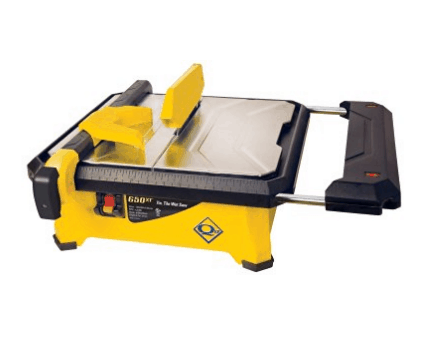 This is a table top wet tile saw that allows very smooth tile cutting with superb stability while operating. It works best for DIYers who need it for occasional work. This entry level wet tile saw helps the homeowners to make precise cuts instead of using manual snapping tools. ​The stainless steel blade and tabletop keeps it away from corrosion with the water spilled over it. The base is made out of plastic and has a flimsy fence. It's deck is quite thin & small and is made out of lightweight metal that bents easily if pressure is applied on it, which misaligns the saw blade. We also noticed that the water reservoir is quite small. The motor heated up after 30-45 minutes of continuous usage. After the repeated use over a week, the blade became dull and required much more force to cut. Buying a dressing stone might help you regain the edge. It did vibrate at times but with a solid surface it works well. All in all, we recommend you to use this for odd jobs and small home improvement tasks but NOT for large tiles/projects. ​So we used this on a 4x6" tile to do the kitchen floor and on a half-bath to install marble tiles and it did amazingly well giving very clean cuts. Next we tried doing the bathroom floor where the tiles were 6"x24" and that's where it struggled. There wasn't enough power to make quality cuts through these large tiles. The guide rail goes up to 7 7/8" only. For a 12x24" tile, we had to build a side table of the same height as the tile saw and add a layer of vinyl to it. It cuts mosaic subway, ceramic, marble or even stone tiles. We replaced the original saw blade (recommended) after around 30-40 cuts and we have made nearly 100 cuts with it. Solid straight and bevel cut ability! It weighs just around 18 pounds which makes it super light and easy to move around/transport. Unlike the Dewalt D24000, this one is very small and compact in size. It's quite easy to clean up the saw as all you need to do is grab a hose, spray on the dusty areas (blast the inside though) and brush it up. Before you reach to the end of the cut (about 1/4" away), back the tile slightly and pivot it against the saw blade so it pops. This will prevent tile chipping and leave a rough edge for you to file it down. Also keep a water jug nearby to refill, you will need it often. Can't afford the high end Dewalt tile saw but still want a decent tool to do your bedroom floor? If you are looking for a powerful and a budget wet tile saw, this is the one you should go for. Chicago Electric is a very powerful saw and can work both on DIY projects and for contractor work. All you need to do is invest in a good blade and you will have a beast in your workshop ready to cut any material. When we received this saw, the packing was not upto the mark. Some washers and lock washers were missing from the box as well. The build looked very solid and well finished, however most of it is made out of plastic. It had sealed bearings on the motor with thermal overload protection. However, when we raised the blade upto 3/8, it wasn't sturdy enough. The table moved quite smoothly as it had the precision linear bar system with an oversized steel frame. The head moved well enough and allowed us to make 22.5 and 45-degree bevel cuts. One important thing you should know is that this saw is prone to water and you should ensure the water doesn't over-spray or get stainless steel washers from the nearby store. We first tried cutting a 3/8" thick marble tile for a back splash. It worked very well and we made some intricate miter cuts with ease by adjusting the height of the blade. You wouldn't believe but we cut huge tiles upto 32x32" with some help, isn't that AMAZING!? We were able to make plunge as well as angled cuts with it! Worked well on porcelain (400 sq ft of 12x24" porcelain tiles for a master bath), ceramic, bricks (for an outdoor kitchen), granite and some paving stones as well. We cut stones like butter and even 2 1/4" pavers quite easily. Sometimes we made a reverse cut on the stone to avoid chipping. While we used it to do flooring in a greenhouse, the water pump ran out after cutting around 18-20 pavers. We then used a garden hose to spray water on the cutting edge. Our advice is to use this to cut the materials slowly and let the blade do it's thing. We also recommend you to buy a decent tile saw blade and replace the original one for better performance. It is bigger in size (due to the steel frame precision linear bar) as compared to the other tile saws in our list. It also is super heavy so it's impossible to move by one man. You will definitely need a stand or a table to use it effectively. Our recommendation is to buy a wheeled stand so that you can work and move it effortlessly. The ABS water pump is quite easy to clean and remove. This wet tile saw is a variation of their model 3540-02 with some good minor modifications. This in turn comes at a slightly high price tag. The good thing is that this new feature will save you from those repeated walk backs to your garage and let you cut the tiles anywhere (even your room). Hmm, sounds interesting? This feature rich, sturdy and compact sized wet tile saw will suit best for the DIYers or homeowner who want to get the small projects out of their way quickly. With decent cuts and easy clean up, it surely is a great choice. We noticed that the saw blade that comes with it seems to be less effective. So first of all, we recommend you to replace that with a glass cutting blade (since they are thinner) for cleaner cuts. Hydro Lock: There are two guards (upper and lower) designed to keep the water splash at a minimum and contained just limited around the blade. The deck (with small rubber pads) is made up of aluminium and is quite thick, rigid and rust-resistant. However, the clamps are of plastic and somewhat flimsy. The arbor isn't perpendicular to the guides, this sometimes made the cuts inaccurate. We had to push back the tile at times to prevent it from cracking. Tip: If you are going to use the side guide, ensure that it's pretty right before hand. We used the SKIL 3550-02 on various tasks like replacing linoleum tile floors with porcelain tile at a client's home, did some kitchen, bathroom (shower) and laundry room tile work. The results were good! It works very well on small projects like these. Sometimes we felt like it is a bit small and we couldn't move the tile into the blade. We cut porcelain, granite, ceramic and mosaic glass tiles with it and the cuts were pretty decent. The largest tile we cut with it was 20x20" and we think anything about that wouldn't fit well. The operating speed of the saw is not very fast as it has an average power motor. Though we were able to make the 22.5 & 45-degree variation bevel cuts with ease. With the aluminium and plastic material used to build this tile saw, the total weight comes down to just 24 pounds. We were easily able to carry it down the stairs, move around and even the installation was done pretty quickly. The compact size allowed us to clean it easily. The cutting cart and the water containment tray were removable, so that made our task easier. This QEP tile saw is a small and powerful contender in our top list. If you are a DIYer, this will perfectly suits your needs and on top of that you can even complete the small contractor jobs with it. We had out expectations clear, since this was a low cost tile saw. It worked perfectly well on the small DIY and bathroom tiling jobs. Using it carefully since the build isn't so sturdy and getting a new saw blade, I must say it worked like a charm for us. Our first impressions of QEP 650XT were mixed. It had a durable steel table and the frame had rubber foot pads for extra stability. The other parts were either made of metal or plastic (fence) which is alright in our opinion. We faced some issues aligning the fence. The guard attached with it works well only with thin flimsy tile saw blades. The thick blades may be too much for that. Sometimes, the splash guard screws blocked the tile (if it was bigger than 3") from moving through. About the table, it did start to rust after a few weeks. It is important to go slow while using it to prevent water splash. The diamond blade while cutting makes a lot of noise, so we recommend you to buy a good pair of ear protectors. Sometimes we even had to double the protection by adding a set of compressible foam in the ear. It comes with a 3/4HP motor with can produce upto 3600RPM. It also has a miter gauge and a rip fence. The an 8-inch table extension helps for cutting/supporting large tiles. We used this to cut some 18" porcelain tiles when we noticed that after a few cuts the water needed to be refilled, we could cut the bottles and some terra cotta like butter. Pro Tip: To avoid chipping, place the cleaner side of the tile facing down while cutting. While cutting the granite tiles (12"), we noticed that if the blade guard isn't perfectly aligned then we had to push pretty hard to cut through them. There was some water splash while doing a ceramic tile kitchen back splash, but for such a low price, you need to be tolerable at times. For more accurate cuts, you can replace the fence with 1" x 2" solid aluminum bar with 2 clamps and once you dial that in, you will see the difference. Overall, the cutting capacity is great. Just make sure to keep a jug of water while cutting, use ear protection and cut slowly to avoid chipping and get the best cuts. This tile saw is very easy to store and move around. It weighs just ~16 pounds which is very light weight. The installation and setup is quite easy as well, in 10 minutes you will be able to good to go. Though it's easy to clean up, the water reservoir can't be removed which is a bad point. Operation wise it's decent so all in all, it's a good bang for your buck. Dewalt DWC860W Wet/Dry masonry saw is a very compact and budget friendly option. It has a very good saw blade that makes you cut different types of materials very effectively. It possesses a rectangular shaped frame which has an adjustable cutter and a stopper. It also has a very durable vertical cutter and cut a lot of tiles in long term. The Dewalt DWC860W is one of the perfect tile saws for you if you deal with the tiles professionally or if you are a serious DIYer. A disappointing point was that it didn't came with a case, probably to keep the price so low. However, this tool needs the case for storage as well as for transport. You can get a good steel or wood case for this. It has a 13-foot water line (with dust sealed switch) that feeds water to the tile saw blade decreasing dust, increasing blade performance and prolongs the saw's life. There are 2 wrenches for changing the blade. There is also a lock-on feature which helps to reduce the fatigue during the production cuts. The saw blade that comes with it is 4.5 inches long and provides excellent cuts. We tested the cutting capacity on different items and we think the motor has quite good power. We were able to cut about 20 sheets of a cement board quite easily. Then we used it to install a kitchen and 2 bathroom granite countertops by using a turbo blade since it cuts granite faster. For making deep cuts, we recommend you to make 2 passes. We even made some angled cuts along the edge of a cement slab quickly. While we tried to cut marble, it didn't work as expected and there was some chipping as well. A bad part about the saw is that it has a plastic made water shut off valve, we advise you to put a small valve towards the end of your hose and reattaching the flow restrictor there or seal it well. Since there is an absence of a blade guard or guide, we tried using the 1/2" material as the guide but the two mounting screws interfered. So we had to eventually cross cut and rip the tile pieces. It weighs JUST 6.6 pounds and the product dimensions are 15.7 x 20.1 x 9.9 inches which makes it really easy to transport outdoors or to another place. It comes with a simple to follow instructions manual so you can learn the basics of setting it up and how to get started quite easily. The handle of the saw is very comfortable (fits a large hand) and has no sharp spots that can hurt. After using various tile saws from almost every brand, we came across this newcomer called the Lackmond Beast tile saw. To be honest, it has blown our minds with it's capabilities. Let's take a deeper look into it's features and our tests right away. The build of Lackmond Beast is quite sturdy (with super solid steel frame) but the stand has smaller wheels and is tough to open and close. The steel pipe saw frame can withstand the toughest conditions as their official website says. The blade was super stable unlike the others that sway away in different directions while operating it. The gliding wheels are on the insides of the tracks so when the tile chips, the flakes won't affect the tile saw motion. We even tested the removable extension table (with rubberized top) to cut larger tiles and it was dead on straight and needed no adjustment. Boom! The blade guard was pretty easy to open up and the splash guard & back splash tray kept our work area dry. One of the serious DIYers from our team tested this at her home to install about 1200sq of tiles using porcelain tiles of 34x18" format. 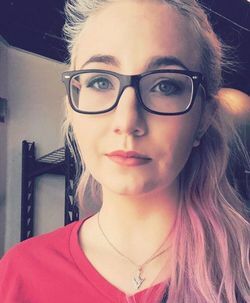 She noticed really consistent and clean cuts throughout. Then we cut 12x24 ceramic tiles and some medium sized marble and granite pieces and even used the plunge feature to cut some V-caps and for wall sockets which worked great. The 13AMP powerful motor can tilt which makes the 22.5 or 45 degree bevel cuts accurate while cutting tiles from both top and beneath. We tried cutting 6", 12", 18" (both diagonally and straight) and the results were very good. One thing we noticed is that the motor bogged a little bit while we tried cutting the pavers. The unique snake pipe water nozzles took care of the water placement for the blade and the over-spray very well. The LED light indicators were really helpful while working to mark things. It is perfect for large tiles and even the small ones. If you want to complete contractor jobs giving a professional finish, this one's for you. 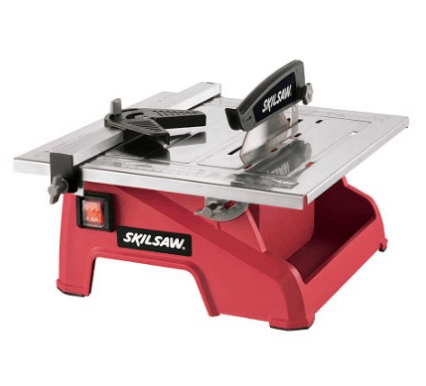 It performs better than most of the 10" tile saw out there in the market! Alright, this saw is heavy. The steel frame and fence add up to the weight. However, they have a choice of two stands (Scissor & Folding Gravity stand with wheels). If you choose the second one, you will have a good time moving it around and will be able to transport easily as well since it's light weight. Be careful while transporting this saw as the angle adjustment lever can drag and get scratched. The metal frame has handles on it's sides for easy handling. Slide the tray about one-third of the way out so the water directly falls into the bucket. One more thing, hold the saw from back when you release the stand or else it will fall on your hand. All in all, we think this one is the best tile saw for anyone (DIYer, contractor etc) looking for a powerful, durable and efficient tile saw. Dewalt is one of the leading brands and provides full support, so you can never go wrong with it! Whether you’re working with glass art, putting together a high-quality model airplane, or remodelling the floor of your bathroom, a tile saw comes in handy. This guide teaches you all you need to know about this incredibly versatile power tool, such as the basics of operating a tile saw, important safety tips, selecting the best tile saw type for what you need, and much more. A tile saw is a power tool with a diamond-coated blade, with water used as a coolant. While they were designed specifically for cutting tiles, they are also perfect for cutting any materials or objects made of glass, ceramic, stone, porcelain or carbon fiber. 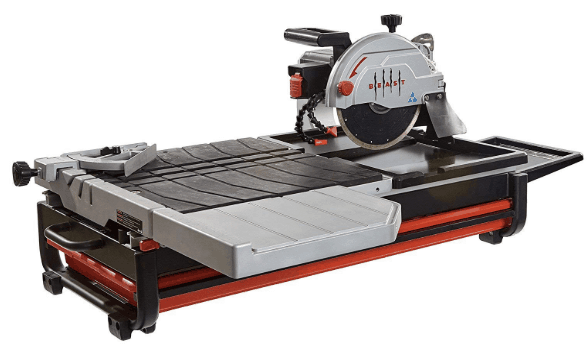 Sure, you might be able to find cheaper equipment alternatives for certain projects (like using a burning string to cut glass bottles), but a tile saw gets the job done consistently and easily, making cleaner and more precise cuts. When picking a tile saw, it’s important to understand its features and specifications, as this helps you choose the most suitable saw for your needs. The greater the blade diameter of your tile saw, the thicker the materials it can cut through. A blade with an 8 inch diameter has a maximum cutting depth of approximately 2 inches, when the 10 inch version has a maximum cutting depth of approximately 2.5 inches. Your saw should be able to cut through your selected object end-to-end in one pass. The greater the blade diameter, the greater the length of the object it can cut through in one pass. A tile saw usually specifies, in inches, the maximum rip cut (aka straight cut) and maximum diagonal cut that it can handle. Some tile saws have features that allow for unlimited cutting capacity, but you should also consider the limitations of the tool’s table size too, and may have to purchase a table extension to fit particularly large objects. A larger blade is therefore crucial for handling thicker materials and larger projects, but of course it is pricier as well. It is also heavier, which affects its portability. It is therefore important to balance your budget with your needs. The greater the horsepower of your saw’s motor, as well as its maximum rpm (revolutions per minute), the better it can handle harder materials such as granite. ¾ HP is sufficient for small personal projects, and 1.5 HP is enough for cutting most materials in most contexts, but industrial saws can run up to 2.5 HP. Your saw’s horsepower may instead be specified as amps & volts, so convert that into HP when necessary. Having enough ‘juice’ is crucial for making clean cuts through hard materials effortlessly, and completing big projects efficiently. That said, the saw quality matters as well, and you should consider if a powerful and pricey premium saw is necessary for your uses. The capacity of the blade refers to the ability of the cutting head to be adjusted so it can hold various blade sizes. Make sure you choose a tile saw with this feature if you wish to use it on multiple kind of tiles and projects. The blade adjustment is the feature of how well the tile saw blade can be adjusted to cut tiles at different angles (bevel or miter cuts). The more angles you can tilt the tile saw upto, the better. Using water while operating a tile saw to cut the tiles prevents damage, helps to cool the blade and lubricates the tiles as well as the tile saw blade for smoothness. There maybe a garden hose or a pump container as a water source, it all depends if you are looking for a portable or a tile saw just to use at your home and not outdoors. Little inconveniences can make or break your home improvement experience, so take note of extra features that could make using your tile saw a lot easier and tidier. Features such as a splash guard and a drain plug, means you can use your tile saw without fear of being soaked. A large water reservoir means you won’t run out of coolant as quickly, while a precision guide bar improves your accuracy. Setting up and maintaining a tile saw may seem daunting, but once you’ve assembled it and gotten into the right routine, it’s fairly easy work. Regardless of which tile saw type you are working with, make sure you are working on a level, sturdy surface, position your tile correctly before cutting, feed your tile towards the cutting wheel slowly and steadily, and turn off the saw whenever it is not in use. Handheld tile saws are light, portable, and frugal. They are best for smaller projects, touch ups, and specialty cuts. Make sure you secure your tile before cutting it, for the best sturdiness and precision. With handheld saws, user fatigue is a common issue, so purchase one with a lock-on switch to reduce fatigue. Using a wet handheld tile saw, which has a coolant system, helps to reduce dust particles in the air. Nonetheless, dry handheld saws are available as well. The most popular versions are wet/dry, which means the coolant system can be switched off. Dust masks are recommended if you choose to dry cut. This is the most popular type of tile saw for personal projects. These usually come with a fence to aid with alignment of your tile/object. The depth of cut provided by tabletop saws is sufficient for most tiles and materials, except for thicker and harder objects like stone pavers. Horsepower for this type of saws usually runs up to ¾ hp, and blade diameter runs up to 7 inches. The line of sight from cut line to cutting wheel is clear, but not always the most accurate. This is not an issue for most projects, but if you require utmost precision, such as for complex glass art, an overheard saw is recommended. To do specialty cuts, you would need a miter extension and plunge cut extension. This type of saw affords the most precision, as its sliding tray system allows you to easily visually align your cut line with the cutting wheel. Overheard motor saws also offer greater horsepower and larger blades, meaning they can handle harder, thicker materials with ease, and process large industrial-size projects efficiently. However, they are the priciest, heaviest, and may require some assembly. Overheard motor saws typically supply water through a pump system, but there are pumpless versions as well. With a pumpless version, you won’t have to deal with the hassle of refilling water or cleaning the water pan, but your saw’s portability would be greatly decreased, as you would require a nearby water source. Like with tabletop saws, you would require extensions to do specialty cuts. I found this amazing video by The Tile Shop which shows some great tips about cutting a tile. Watch it now and learn the different methods of tile cutting. You’re grinding materials, so tiny sharp shards may be flying off. Make sure you wear eye protection at all times. The usual safety tips for operating power tools applies, such as tying back long hair, avoiding loose clothing, and wearing sturdy shoes. Dust particles are a concern when dry cutting, as they are harmful to lung health. Make sure you wear a dust mask or some other form of respiratory protection. A dull blade or a clog-up of debris makes your saw harder to operate. Not only that, you would be more tempted to apply greater pressure in guiding your object towards the cutting wheel, increasing the likelihood of accidents, such as dangerous chipped-off projectiles or an overheated blade. Pack a medical kit, do regular checks to make sure it remains well-stocked, and be aware of its location. 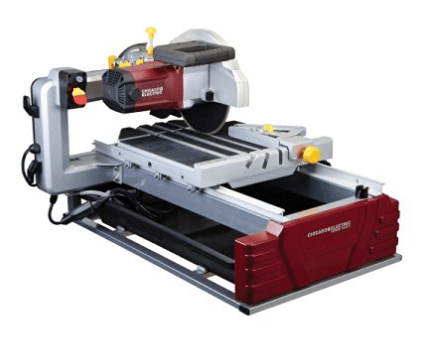 Depending on the materials you are working with, it is sometimes possible to substitute a tile saw with other tools, either as a way to be thrifty, or to choose an even more suitable tool for a specific need. We hope that this guide was useful to both beginners and seasoned carpenters in the crowd. From the basics of choosing and using a tile saw, to the detailed pros and cons of each saw we tested and reviewed here, it’s a guide for every skill level. Suitable equipment makes home improvement much less stressful and much more enjoyable, so be sure to pick the right tools for your projects. And don’t forget to stay safe.